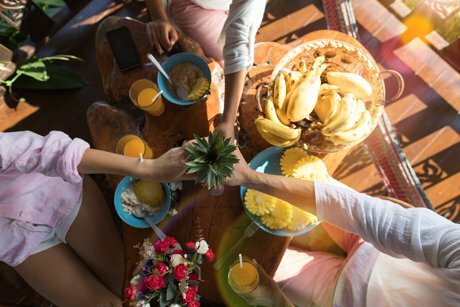 Memories made around the dinner table are priceless according to folks living in the Maui real estate area. Families find it simple to create field to fork meals after making a trip to one of the various farms and farmers markets dotting the island. All around the landscape fresh fruits, veggies, grass fed meats, spices and more can be obtained. Many venues come with a rich history filled with tradition which makes trips worthwhile on their own even without the shopping. Kula Country Farms is a great place to spend the day. As a fourth generation farm, the offerings here have a solid reputation for being the very best. The farm stand is stocked daily with foods right from the fields. Fruits are fantastic and shoppers can take home jars of sweet jams and other baked goods as well as cartons of plump, juicy berries. The onsite children’s garden encourages kids to learn all about gardening and gives parents an opportunity to stroll the aisles while their offspring are occupied. Seasonal fun is also found here with residents heading on down to the Maui property for the annual pumpkin patch in autumn. Nearby, the Upcountry Farmers Market proudly boasts of their title as the “oldest living farmers market on Maui.” A weekly spot to shop, folks can gather together at the Kulamalu Town Center on Saturdays. Baskets are filled with goods from over 45 vendors including coffee grown on the island, fragrant flowers, macadamia nuts, and organic vegetables. The catch of the day is perfect for dinner and fisherman proudly show off their bounty from Maui’s plentiful ocean waters. In the West Maui real estate region, another true gem is the Farmers’ Market of Maui in Honokowai. Held daily from 7 a.m. to 7 p.m. this little market is a feast for vegetarian’s eyes. Family owned and operation the locale’s guests are greeted with smiles and samples ready for tasting. Kula Country Farms, Upcountry Farmers Market and the Farmers’ Market of Maui in Honokowai are just three of many worthy markets on the island. Check out more favorite and tasty locations here and venture forth in search of fine food.